This is about the time of the season when small-sample issues start to wash away and genuine performances changes can be detected. Last year around this time I wrote these pieces which attempted to tease out 1. how much weight to place on performance in the first two months of the season, 2. whether age was a meaningful factor to answering #1, and 3. whether it mattered if the change in performance was occurring in the tee to green game, with the putter, or both. I found that past performance should be weighted about 3.5 times more than performance in the first two months. Also, younger golfers who show a lot of improvement tend to retain that improvement more than middle-aged or older golfers. It also turns out that golfers who have improved their putting tend to play worse going forward than those who improved their tee to green play. Coming into 2015, I had Daniel Berger rated as a below-average Tour player – largely because he hadn’t particularly stood-out in his 2014 season on the Web.com Tour (he performed slightly below what you’d expect an average PGA Tour player to do on that tour). Berger clearly had potential – he had finished as Golfweek/Sagarin’s 7th best NCAA golfer in his final season in 2012-13 – but he hadn’t clearly emerged as a future star like the similarly aged Justin Thomas or Jordan Spieth. Well, all that is moot after Berger’s start on Tour; 5/6 made cuts, performance similar to what you’d expect from a top 10 player in the world, and a playoff defeat in his twelfth PGA Tour event. Applying the criteria from above – young players and those with improved tee to green play retain more of their improvement – Berger grades out well. Not only is Berger only turning 22 in April, but he’s dramatically improved his long game play in his 2015 Shot Link rounds compared to his 2014 Fall Series Shot Link rounds. He was carried a bit in the fall by a hot putter (+0.9 strokes gained/round), but this season’s success has been entirely driven by his play with his irons/driver (+2.5 strokes gained/round). I doubt Berger will continue to play at a top ten in the world level, but he already looks like a clear future star. James Hahn has already won in his break-out 2015 season. 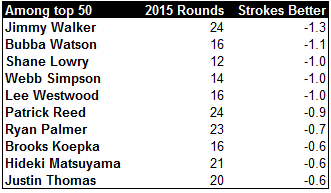 Coming into 2015 he didn’t project as particularly likely to remain on Tour. In fact, I had Hahn rated as 205th out of all players with any PGA Tour status entering the season. Hahn has improved across the board in all key stats: he’s improved his iron shots by +0.5 strokes/round, his drives by +0.2 strokes/round, his putting by +0.5 strokes/round, and his short game by +0.5 strokes/round. I’m still not totally sold on Hahn as he’s has seasons worth of play at below Tour average, but he’s certainly moving in the right direction. It seems like a long time since Brendan Steele’s rookie year win at the Texas Open in 2011. That win earned Steele notoriety and regular place in the Mickelson practice round matches. Designed in part to prepare guys for the rigors of Ryder Cup play, Steele watched Keegan Bradley and Rickie Fowler earn spots on those teams, while he suffered through a string of mediocre (at least in terms of performance) seasons. However, last year was his best yet on Tour and he’s kept the momentum going so far in 2015 – 5/5 in cuts and a 2nd at the Humana. Steele isn’t that young, but has improved across the board, especially in the long game (+0.5 strokes/round over last year and he’s hitting his drives 5 yards further). Two other notables are Lucas Glover and Boo Weekley. Both have long track records of being awful at putting, but both have improved their putting numbers a ton in the past few months (Glover is now merely one of the worst rather than the absolute worst of all time). Neither have made many strides in the rest of their games, so I seriously doubt whether Boo Weekley especially can continue to play at this level. He has a decade of awful putting in his past and it strains credulity that he has all of a sudden become average. Quickly running through the others, Wheatcroft and Laird are hitting their irons much better this year, Knost is relying on putting+short game improvements, and Collins is also riding a great short game. Zac Blair stands out as a young guy who should have no trouble keeping his card as a rookie. Of these Shane Lowry sticks out. Lowry has played great in three US stops so far in 2015, earning enough FexEx points where he would be inside the top 100 in only four events. In my ratings he’s climbed all the way to 33rd after spending last year hovering around 100th. Lowry is only 28 and his success this year has been fueled by great long game (approach shots+drives), so I like his chances to remain around his current ranking. Lowry also has a very good shot at earning his Tour card for next year. He’s already at 222 FedEx Cup points – only 216 short of last year’s 125th finisher – and is pretty much guaranteed entry into at least seven more events plus any regular events he qualifies for or earns sponsors invites into. My numbers are also coming around slowly on Patrick Reed. Reed’s career to this point has been marked by turmoil – four wins but also a lot of MCs and really inconsistent overall play – but he hasn’t missed a cut since July and his play this year has been driven by increases in his driving distance (+5 yards) and better approach shot play (+0.4 strokes/round). I’m not sold on Reed as a top ten player, but he’s definitely better than my numbers thought two months ago. – For this, first I calculated their performance in terms of strokes better than the field per round and then I compared that to their projection from the first of week of January 2015. I realize this is a bit of a black-box, but basically I try to find who is playing much better than my system expected going into the season. 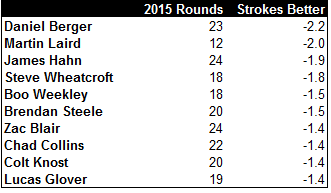 I’ve included only golfers with at least eight rounds played in 2015.